Acclivity rang in the new year early on Friday by releasing AccountEdge 2012, the latest version of the company’s small business accounting software. The app has been redesigned, adding a number of new features, including the ability to track mileage and create multiple billing rates. AccountEdge’s redesigned command center makes the software easier to use, according to Acclivity. It features the same flow chart layout, but adds a new sidebar, additional menus, and a Sync and Lists feature that lets you read and navigate company files. Users will also be able to create a billing rate matrix, set multiple rates for the same type of activity (say, brand consulting), and then select the rate they’d like depending on the specific customer or employee. 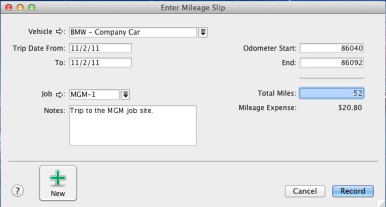 The app's new mileage tracking feature makes it possible to add and track specific vehicles used for business trips. Users can add dates, vehicle used, mileage, and any additional notes, then add it directly to a customer or employee invoice. There are several miscellaneous updates, as well: statements with invoice details; new invoice and statement templates; weight fields on invoices and packing slips; more than 50 new fields for sales reports; the ability to restore a company file without having to open AccountEdge; longer statement descriptions; and a quick access welcome window. AccountEdge 2012 is available on the Acclivity website for $299; $159 for users upgrading from a previous version. The software requires a Mac running OS X 10.5.8 or later.